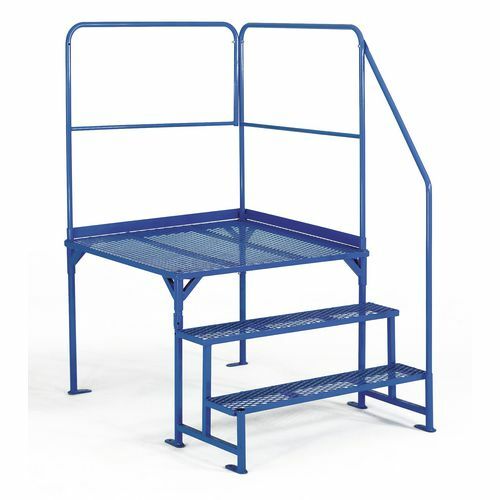 Manufactured from mild steel with expanded steel treads and platform. When working at a moderate level off the ground, staff members are at risk of being hurt if, for instance, they are loading, unloading or repairing whilst using a standard step ladder. With our work platforms their job is made safer and easier, it allows you access to moderate off-ground levels between 18 and 45 inches, with a 1000 x 1000mm platform to stand on, so loading or repairing from above ground levels is simple. Manufactured from mild steel with expanded steel treads and platform we can assure you this is a sturdy product, making it possible for more than one person to work at the required level at the same time. NB: When specifying the correct height the optimum operator working height is 1.5m above the platform height. Finished in an epoxy powder coated blue, they are available in four heights; 460mm, 690mm, 920mm and 1150mm. Our work platforms will accommodate your requirements and be beneficial for your employees - they have a 12 month guarantee and FREE UK Delivery.